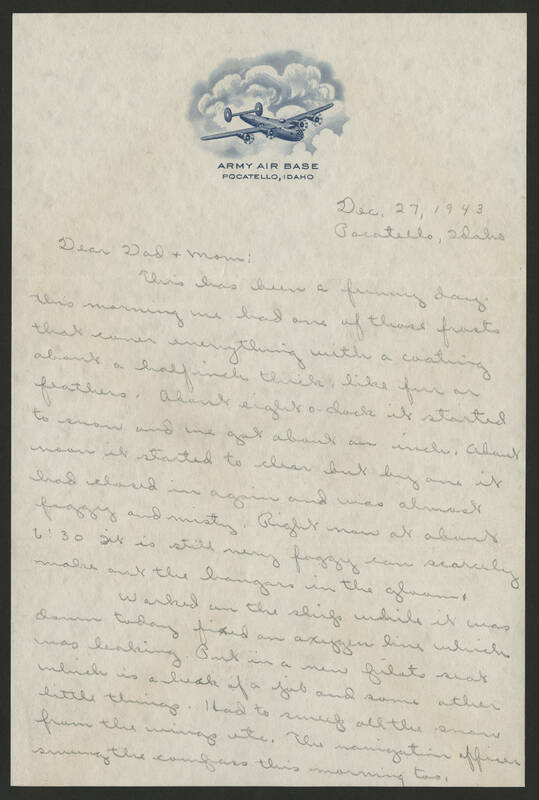 Dec. 27, 1943 Pocatello, Idaho Dear Dad & Mom: This has been a funny day, this morning we had one of those frosts that cover everything with a coating about a half inch thick, like fur on feathers. About eight o-clock it started to snow and we got about an inch. About noon it started to clear but by one it had closed in again and was almost foggy and misty. Right now at about 6:30 it is still very foggy can scarcely make out the hangars in the glnam[?]. Worked on the ship while it was down today fixed an oxygen line which was leaking. Put in a new pilots seat which is a heck of a job and some other little things. I had to sweep all the snow from the wings etc. The navigation officer swung the compass this morning too.